Conventional Synthetic Aperture Radar (SAR) requires the platform to fly an approximately linear trajectory (i.e. a straight flight path at a constant speed and constant altitude). 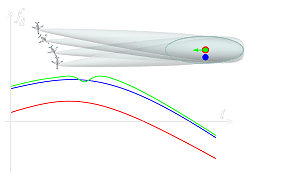 Non-linear SAR technique uses a combination of platform manoeuvre and novel processing to separate the effects of a target’s radial velocity and cross-range displacement, giving accurate estimates of both. Even in conventional SAR an Inertial Measurement Unit (IMU) detects any deviations of the antenna phase centre from the notional linear trajectory, and corrections to the phase of the received signals are computed and applied to compensate for these deviations. Phase corrections are normally applied to the returns received from each pulse to remove the slope of the Doppler histories in a process known as focussing. 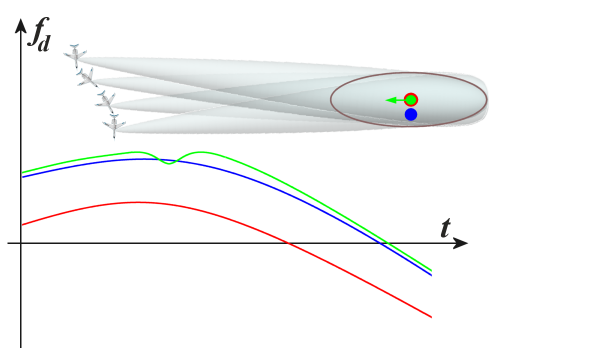 The Doppler shift is interpreted by conventional SAR processing as a displacement in the cross-range direction. The moving target will then be displayed in the wrong position within the image. 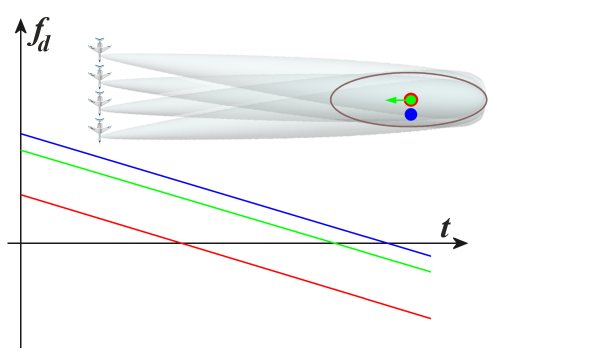 This effect is called “azimuth ambiguity problem”, and is often overcome by using a separate, interleaved, Ground Moving Target Indication (GMTI) mode to detect and locate moving targets. In the non-linear SAR technique, this IMU measures the actual platform trajectory too. 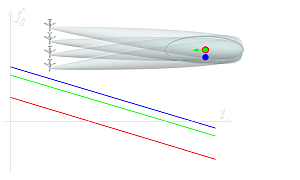 For each estimated pixel in the image, the measured trajectory is used to calculate the expected phase histories of a scatterer in that pixel but with a range of different radial velocities. These alternative phase histories are then correlated with the received signal to find the best match. This technique allows the platform to fly a wide range of planned and unplanned manoeuvres, improving platform survivability in potentially hostile environments. The technique provides high resolution images free from the image distortion caused in conventional SAR imagery by moving targets, and allows the accurate target location of both stationary and moving objects. The beamforming procedure must follow these manoevres in all SAR-Modes to illuminate the scene of interest.